This past weekend, I joined my fellow TNCore coaches to learn about the big new push in literacy teaching that we will be training on this summer. The method we will be training is called SRSD. I will write much more about this later, but it's basically a teaching strategy for more effective pre-writing. One element it stresses is the need to teach genre specific vocabulary. With Common Core I am teaching far more analysis than I ever did, which calls for students to not just remember genre terms like "concrete" or "imagery," but to apply them in analysis as well. 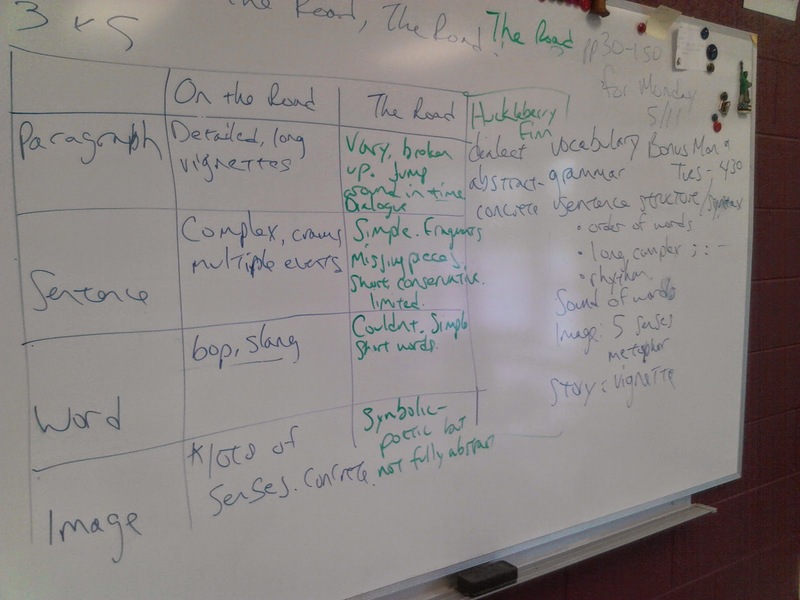 In a larger unit about Cormac McCarthy's The Road, we have had several reading lessons this week using Jack Kerouac's On the Road. I wanted to do an assessment on writers' writing style. I ramped up the genre-specific vocabulary from last year. The picture on the right shows the blackboard from our discussion (sorry it's so messy--you'll need to get used to it as I move into regular posts here). I began on the right, asking students to provide key terms about writing style: what kinds of books do you like? How do you know when the writing is good? I described my own experience when I came to the end of On the Road and thought, "I really loved this book!" and then wondered, "Why?" I had to go back and read it a second time--this time with a pencil for annotation--to figure this answer out. Students needed a lot of prompting to specify how sentences, words and paragraphs could be presented in different ways. The depth of this discussion led to more genre-specific terms like syntax, rhythm, vocabulary/diction and imagery. With that, students set up tables in their Google Docs notebooks to compare. They were given two minutes to skim On the Road for its style, then as we went over the various categories, we added words to our genre-specific vocabulary list such as dialect (I was thrilled when I heard this one, considering what the culminating reading would be), abstract/concrete, and flow. Two more minutes were given to re-read The Road. This discussion went much more quickly. Students discovered McCarthy's use of irregular sentence structure, "poetic but not fully abstract" imagery (thanks to Natalie, one of the stars of this class), and "conservative" use of detail in the sentences. I asked students briefly which one they preferred--and I had them support their answers with the genre-specific terms we had built. 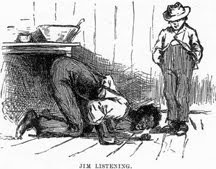 Then I gave them the in-class writing assignment on Huckleberry Finn, Chapter 19--Huck's lyrical description of life on the Mississippi River and the most poetic part of the book. We have read three writers this week who expressed themselves in unique styles: Cormac McCarthy, Jack Kerouac and now Mark Twain. Describe the writing style that you found most effective and contrast it with the others. Remember to use genre-specific words in your discussion. Bottom Line: using the genre-specific vocabulary gave students a stronger foundation from which to write our last critical analysis of the year. It was an improvement over last year's lesson, and I am proud to pass it on to you.